GAS: It may prove difficult to rebalance Europe's dependency on Russian energy in a short-term perspective, but in the long term, the EU should focus more on finding alternative energy sources. 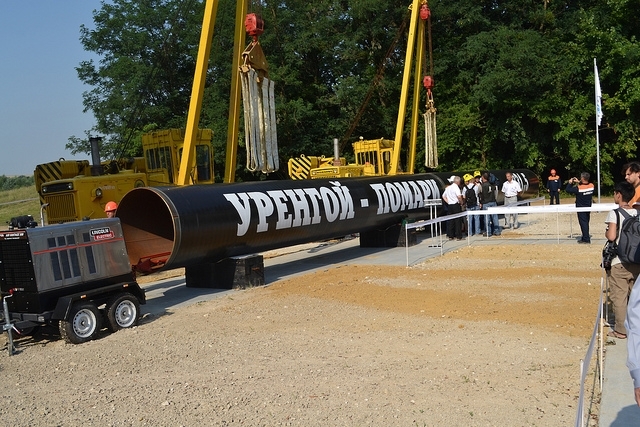 Until recently, 80 per cent of Europe’s gas supplies were transported through Ukraine. Today, this share is reduced to 40 per cent. Russia’s objective is independence from Ukraine within 2019. The lack of agreement on the basic principles resulted in 2006 and 2009 in the so-called gas wars between Russia and Ukraine. These bilateral gas conflicts had also consequences for supply of Russian gas to the EU. As a consequence Russia decided to reduce its gas transit dependence on Ukraine by building the Nord Stream pipeline, embarking on the now abandoned construction of the South Stream, and by taking some other measures. Ukraine decided to seek closer cooperation with the EU, also in the field of energy, which led to conflict with Russia that turned into an armed conflict in March 2014 with Russian annexation of Crimea and support to pro-Russian separatists in eastern Ukraine. “As a result of the confrontation between Russia, the largest energy source for the EU, and Ukraine, the most imoritant transit country for gas, the EU became more occupied with energy safety in the union. The EU started focusing more on a holistic approach to energy safety, now known as the Energy Union”, according to Jakub Godzimirski, senior research fellow at NUPI. The recent restructuring of the European Commission, with the appointment of the new Vice-President responsible for energy union, as well as decisions on the future energy priorities taken at the meeting on the Energy Union on 25 February 2015 may signal a new era in EU energy policy, also towards Russia. Although in the short-term perspective reducing EU’s energy dependence on Russia can be difficult, it is important to consider how to limit the damage caused by the current application of Russian grand strategy and how to strengthen Europe’s position vis a vis Russia. In the mid- and long-term perspective the EU should however decide whether Europe, for the sake of its energy security, should invest more effort in finding alternative sources of energy to make itself less dependent in energy terms on its apparently less predictable Eastern neighbor whose actions have recently gravely undermined the exiting international security order. “The important thing now is to secure gas supplies to both EU and Ukraine, while in the long term, it is important to become less dependent on Russian gas”, says Godzimirski. The most recent tension in gas relations between Ukraine and Russia began on 19 February 2015 when Gazprom decided to start supplies of gas directly to areas controlled by separatists in Eastern Ukraine and reduced correspondingly gas supplies to Ukraine. Ukrainian authorities accused Gazprom of not supplying the volumes of gas that were agreed in the so-called ‘winter package’ – an accord that was reached between Russia, Ukraine and the EU on 31 October 2014 that was to secure supplies of gas to Ukraine and to Europe during the winter. Although the recent tensions could herald a new gas war between Gazprom/ Russia and Naftogaz/Ukraine which could also mean problems for gas supplies to Europe, most of the experts meant than none of the parties were interested in escalating the conflict. At the planned trilateral talks on energy between the EU, Ukraine and the Russian Federation that took place in Brussels on 2 March 2015 the parties confirmed the intention to fully implement the Winter Package; discussed the sensitive issue of gas supplies to certain areas of Donetsk and Lugansk regions, acknowledging that this issue is highly complex in legal, technical and political terms; and finally stated their willingness to continue their trilateral talks in order to agree on the follow up to the gas Winter Package, as called for in the Declaration of Minsk of 12 February 2015. According to this newly reconfirmed agreement Naftogaz is to pre-pay and order from Gazprom sufficient quantities of gas to ensure covering all domestic consumption by Ukraine in March, Gazprom is to deliver up to 114 mcm per day of pre-paid and ordered gas quantities to mutually agreed delivery points and Naftogaz is to guarantee an undisrupted transit of gas to the EU. The accord reached on 2 March 2015 may mean that some of the most burning questions are addressed and supplies of gas neither to Ukraine nor to the EU will suffer. This does not, however, mean that the core problems in EU energy relations with Russia are solved.